As many as 40,000 barrels (1.7 million gallons) of oil a day may have been gushing out from a blown-out Gulf of Mexico well, doubling many estimates. The US Geological Survey says that flow rate could have been reached before a cap was put on the well on 3 June. BP's chairman has been asked to meet Barack Obama next week, amid assurances from the UK and US that bilateral ties will not be affected by the crisis. UK PM David Cameron and President Obama will discuss the spill at the weekend. Oil has been leaking into the Gulf since the Deepwater Horizon rig exploded on 20 April and sank off the coast of the US state of Louisiana, killing 11 workers. BP said the device placed on the well collected 15,800 barrels of oil on Wednesday - slightly up on the 15,010 barrels collected in the previous 24-hour period. New estimates for the oil spill prior to 3 June follow an assessment by a team of scientists put together by the US government and coordinated by the US Geological Survey. "The lowest estimate that we're seeing that the scientists think is credible is probably about 20,000 barrels, and the highest that we're seeing is probably a little over 40,000," said Marcia McNutt, director of the US Geological Survey. The new estimates are staggering and only add to BP's woes, the BBC's Andy Gallacher in Florida says. The British oil giant has estimated that up to 19,000 barrels a day was leaking from the ruptured well before they managed to partially contain the spill. Last month, BP was estimating the leak to be the equivalent of just over 5,000 barrels per day. "This is a nightmare that keeps getting worse every week," said Michael Brune, executive director of the Sierra Club, America's oldest environmental organisation. "We're finding out more and more information about the extent of the damage... Clearly we can't trust BP's estimates of how much oil is coming out." Relations between BP and the White House are now more strained than ever, our correspondent reports. BP chairman, Carl-Henric Svanberg, has been invited - some would say summoned - to the White House next week, he adds. The meeting will be held amid concerns that BP may not have enough cash to pay for the clean-up operation and compensation for those affected. 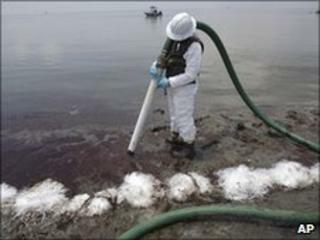 US Attorney General Eric Holder has warned that Washington will "not pay a dime" for cleaning up and that BP will be held responsible for all damages. And the Speaker of the House of Representatives, Nancy Pelosi, has accused BP of a "lack of integrity" over its approach to the spill. Ms Pelosi is among a number of US politicians who have suggested that BP should be forced to suspend dividend payments until it is clear the company has enough cash. That has raised concerns in the UK, where BP's dividends form a crucial part of pension funds for millions of Britons. The sharp criticism from the US has been described by some UK politicians as growing anti-British rhetoric. British Prime Minister David Cameron said on Thursday his government was ready to help BP do all it can to deal with the situation, and understood the US government's frustration. "The most important thing is to try to mitigate the effects and get to grips with the problem. It's something I will discuss with the American president when we next talk," he said. On the markets BP's shares closed down 6% in London on Thursday, having earlier fallen as much as 12%.